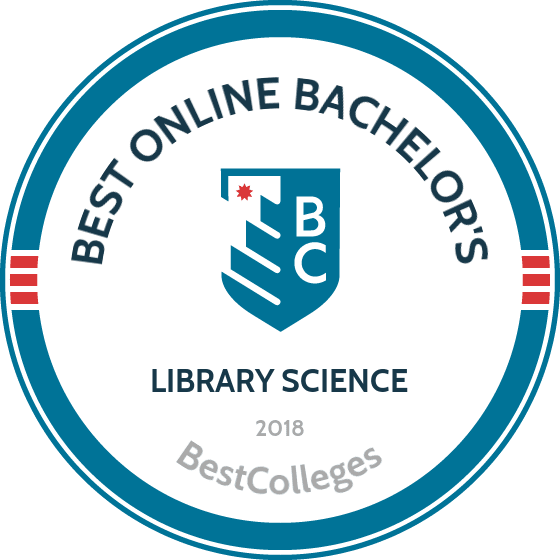 What Are The Best Online Bachelor's in Library Science Programs? What Else Can I Expect From an Online Bachelor's in Library Science Program? Contrary to conventional understanding of the field, library science doesn't just involve sorting books and archiving documents. Online library science bachelor's degree students learn how to master information, which requires skills in collection, interpretation, synthesis, and effective presentation. Because of this, these professionals succeed in a variety of industries, including corporate librarianship, health information sciences, market research, and database administration. The U.S. Bureau of Labor Statistics projects that jobs in library science and related fields will grow between 2016 and 2026, including 13% growth for curators and archivists and 9% growth for librarians. All library science bachelor's degree online programs cover topics in the organization of information, collaborative leadership, and research and inquiry. These are all important skills for business and academic professionals. Most baccalaureate programs also include a capstone requirement, usually in the form of a research project. Additionally, many schools provide internships or other field opportunities to help students gain hands-on experience, advance into a graduate program, and find employment after graduation. Beyond certain common characteristics, each program has different concentrations, courses, and focus areas. If your career goals lie in education, consider a program grounded in information literacy, teaching, and learning in the digital age. If you're drawn to a particular type of literature, such as children's or young adult fiction, be sure the program covers this area of interest. Because online library science bachelor's degrees are so flexible, you can always craft your own interdisciplinary concentration or minor. A prominent metropolitan university campus, the University of Nebraska at Omaha offers an online undergraduate multidisciplinary degree with a concentration in library science. This degree trains students to collect and curate library information in legal, governmental, corporate, private, or medical settings. Through the multidisciplinary studies program, the 120-hour online library science bachelor's degree provides students with the technological tools and leadership skills needed to work with learners and information seekers of all ages. A mandatory capstone project provides the hands-on experience needed for students to find employment following graduation. The University of Nebraska at Omaha is located in the heart of Omaha, Nebraska and works in cooperation with the city to establish learning opportunities and community networks. Applicants to the multidisciplinary studies online library science bachelor's degree must be at least 21 years old, have a high school diploma or a GED equivalent, must be 21 years old, and submit SAT or ACT scores. The University of Southern Mississippi, based in Hattiesburg, has an online bachelor of science degree in library and information science that serves students in Mississippi and across the nation. Since the program is all online, out-of-state students pay the same tuition rate as residents. The online degree in library and information science is ideal for students seeking to manage a branch library or work in an educational setting at a public library or at a primary, middle or high school library. Classes meet each week in live, virtual classrooms where students may see, hear, and interact with the instructors. Coursework for the online library science bachelor's degree covers collection development, cataloging, library management, and information technology as well as children’s or young adult literature. Students must complete an internship or practicum in a library or archive near them in their senior year. For admission as a freshman, applicants must complete the college preparatory curriculum with a minimum high school GPA of 2.0 and submit ACT or SAT scores for evaluation. Transfer students must have an associate degree from a regionally accredited institution or 30 credit hours in designated coursework with at least a 2.0 GPA. For more information about admission requirements, click here. Northern Kentucky University is a private school located in Highland Heights, just minutes outside of Cincinnati. The online bachelor of science degree in library informatics at NKU provides students with skills needed to research, compile, analyze, and prepare information for individuals and communities. The program also emphasizes information management and preservation of primary source materials. Within the 120-credit online library science bachelor's degree, students complete 30 required credit hours in courses on conceptual information trends and the practical digital tools needed to work with data. Coursework is grouped into three categories: organizing information, accessing information, and analyzing information. Graduates of the program can pursue careers at libraries, governmental agencies, corporations, and public institutions. In addition to the NKU application and fee, applicants must provide high school transcripts and ACT or SAT scores for admission. The information and library science bachelor's degree at the University of Maine at Augusta focuses on information gathering and information assessment. The degree also provides a broad liberal arts education and the necessary critical-thinking skills to students seeking a library or information specialist career. Courses for the information and library science degree include information literacy, library management, web design, and cataloguing and technical processes. The 120-credit program is taught asynchronously, and students complete an internship under the tutelage of a librarian as they learn about various aspects of library science. Students can complete general education courses at any regionally accredited institution. First-time applicants must submit official high school transcripts, GED, or HiSET scores. The SAT is not required for admission to the university but the information and library science program requires a GPA of 2.5 or higher in 30 credit hours, or an SAT score of 1000 or higher. Students lacking one or both of these criteria will be admitted to the associate degree program in information and library science and, after completion of 30 credit hours, will be transferred to the online library science bachelor's degree. Clarion University's bachelor of science in liberal studies with a concentration in library science is ideal for students that are interested in learning more about information collection and exchange. With completion of the online liberal studies degree with a concentration in library science, students can pursue entry-level careers in library settings as well as continue on to graduate level studies in the area. The program consists of 120 credit hours, and core coursework for the degree focuses on information for life, informed citizenry, information for healthier living, and organization of information. Admission to the online library science bachelor's degree requires high school transcripts along with ACT or SAT scores. Students with a GPA of 3.64 or higher, an ACT score of 25 or higher, or SAT math and reading scores of 1220 or higher may be considered for the honors program. Transfer students must have at least six credit hours, with a GPA of 2.0 or higher, from a accredited college or university. Students pursuing a library science bachelor's degree online usually take the same foundational coursework, regardless of the school they are attending. However, course structure and content vary depending on program philosophy and instructor expertise. For example, liberal arts programs tend to contain more electives than programs that focus on a specific career path or industry. Some online library science degrees include specialized courses like youth library services or information technology. The list below details five common classes for online library science bachelor's degrees. Some courses prepare you for certain jobs or duties. Although most programs will have some version of these courses, keep in mind that coursework tends to differ by program, especially at the advanced level. Don't be shy when speaking with a school's admission office. Ensure that you learn all the details before committing to a program. Information Agencies and Services: Grounded in hands-on practice and virtual field trips, this course trains students to identify and analyze information providers in the for-profit and nonprofit sectors. Students learn how to use user-centered systems and services rendered by the government. Career librarians and professionals in the computer and data analytics fields may benefit from this course. Leadership and Management in Libraries: This business-oriented course teaches students fundamental supervisory skills, including training staff, implementing collaborative work strategies, creating business plans, and managing the financial calendar. All information professionals may find this class useful. The course prepares library science students for schooling or work in other fields like human resources and entrepreneurship. Information Architecture: This advanced course centers on digital information systems and user experience. Students learn taxonomic theories and how to develop and test interface design. Additional topics include navigation, labeling, and organization of data. As library science integrates more aspects of information technology and data management, students can expect cross-over between the fields. As a result, students learn innovative practices and can take advantage of dynamic career opportunities. Cataloging and Classification: A fundamental library science topic, this course examines the primary techniques and support tools used in library-oriented classification and archiving. Additional topics include descriptive and subject heading, authority control, bibliographic utilities, and online catalogs and data management systems. The course is of most use to reference librarians, but the ideas and skills also benefit information scientists of all kinds. Grant Writing and Development: This course trains students to seek out and apply for external funding. Students learn to cultivate community partnerships as well as allocate resources and services to underserved populations. A general but important topic, grant development is useful to all businesses and organizations. These skills are especially critical for careers in the nonprofit sector. How Long Does it Take to get an Online Bachelor's in Library Science? Online library science bachelor's degrees, like other baccalaureate programs, generally require at least 120 credits and take four years to complete. Common degree requirements like internships or capstone experiences may also lengthen completion time, particularly if a school requires you to complete work with a partner organization in their area. To avoid this, enroll in a program that allows you to pursue an internship in your local community or with your current employer. Another way to earn your bachelor's more quickly is to prioritize schools that offer accelerated classes and summer enrollment. These options not only provide scheduling flexibility, but also enable you to fit in more coursework each semester. Course structure also dictates the length of a library science bachelor's degree online program. Though remote classes are usually asynchronous, some colleges and universities follow a cohort format. A cohort format requires you and your peers to progress through a program concurrently by taking one class at a time. This model may benefit busy working professionals, but it doesn't allow for the freedom and speed of individually paced learning. Accreditation reflects a college or university's ability to confer valid degrees recognized by employers, professional organizations, and government entities. Two main types of accreditation exist: national and regional. National accreditation is a stamp of approval from a national organization working with the U.S. Department of Education (ED) and the Council for Higher Education Accreditation (CHEA). Schools that are nationally accredited are usually specialized, vocational, or for-profit in nature. Regional accreditation is conferred by one of six organizations, depending on the location of a school. This type of accreditation reflects high standards for academics and professional outcomes. Regional accreditation is generally considered more valuable and prestigious than national accreditation. Online library science bachelor's programs can also be accredited by an industry-specific organization such as the American Library Association. The ED ensures that colleges and universities follow national education mandates by taking charge of a school's federal funding, including awards like the Pell Grant and the Stafford Loan. CHEA is a nonprofit whose mission is to advocate for and maintain the academic integrity of its 3,000+ member institutions. CHEA schools also receive private funding, research support, and student resources. You can visit the ED's and CHEA's websites for more information on regionally and nationally accredited schools. The table below utilizes data from Payscale to lay out the median salaries for library science bachelor's degree graduates. You can pursue the majority of these careers with baccalaureate credentials and advance by accumulating work experience. Additional formal education often speeds up this process, enabling you to develop specialized skills in a shorter amount of time. Additionally, certain positions, like information architect, require knowledge and training not usually found in a bachelor's program. For these specialized jobs, you may need a certificate or master's degree. At its core, library science represents the management of information. Consequently, an online library science bachelor's degree sets you on the path to a variety of career options. You can choose to work in a team as a marketing professional or library director. You can also opt to work independently as an archivist, computer analyst, or digital scientist. Whatever your calling, library science professionals personify attention to detail, effective problem solving, and assessment of multifarious information sources. These professionals help patrons find information and conduct research. They can work in multiple settings, including academia, law offices, and corporations. Librarians also organize library content, create and maintain reference systems and digital archives, and provide outreach and educational opportunities for the community. You can become a librarian with a bachelor's degree, but additional school and professional training result in better job prospects. Using exceptional research and data analysis skills, instructional coordinators work in schools, government agencies, or private educational organizations. They design, help implement, and analyze the effectiveness of curricular models and teaching materials. Instructional coordinators also mentor and provide training to other educators. These professionals usually start out as teachers and general administrators. These information specialists collect, organize, store, and preserve permanent records and other important documents. Because information is now largely digital, archivists should possess advanced data analysis and network management knowledge. With such a varied and useful skill set, archivists can work in many settings, including public libraries, universities, government organizations, and private companies. These research experts aggregate and analyze digital information in order to create new technology and find new uses for current technology. Research scientists also solve problems in medicine, science, business, academic, and other fields. Because they operate with such advanced skills, information research scientists generally possess at least a master's degree. These professionals collect and analyze consumer, competitor, and other market data to help businesses create strategic plans. Market research analysts not only respond to sales trends, but also anticipate them. They usually work in teams and must possess clear communication and effective interpersonal skills. Entering this profession usually requires a master's degree, but a bachelor's with additional professional training may suffice. Online library science bachelor's degree students can accelerate their career development by joining a professional organization. These independent entities advocate for favorable governmental policies and support research advancement. And though participation usually requires an annual fee, members benefit from opportunities to connect with colleagues and partner organizations through workshops, social events, and large multi-day conferences. Library science students also benefit from scholarships, internship and job boards, and academic resources like the American Association of School Librarian's eLearning seminars. American Library Association: As the premier library science professional organization in the U.S., ALA oversees accreditation for certificate and degree programs. Members benefit from professional development and career opportunities, as well as conferences and generous scholarships. American Association of School Librarians: Serving more than 7,000 members, AASL advocates for education and accessible academic resources. Members enjoy access to awards, grants, and scholarships. The association also holds an annual conference and supports professional development through its research publications. Association for Information Science and Technology: ASIS&T has supported research and educational initiatives in information science for over 80 years. The association provides members with project funding opportunities and up-to-date literature on new strategies and innovations in the field. Association of Independent Information Professionals: Unlike most professional organizations, AIIP specifically supports freelancers and entrepreneurs working in information science. In addition to its annual conference, AIIP also hosts business partnerships and career development workshops. International Federation of Library Associations and Institutions: The only global organization on this list, IFLA was established in 1927 to unite library science professionals. Today, the organization represents information professionals from 140 countries. IFLA offers conferences, social events, and research opportunities. The federation also publishes a scholarly journal and publicizes funding opportunities. While conducting research on prospective online library science bachelor's degrees, you should factor in cost and financial assistance, as well as how a school aligns with your interests and career goals. Student loan debt constitutes one of the major burdens for college graduates. Tools like the Free Application for Student Financial Aid (FAFSA) help you sign up for multiple awards and loans simultaneously. You should also look into funding opportunities provided by community and professional organizations such as the American Library Association.